Every crypto project search for ways to increase adoption and to build use cases. When Byteball held the first edition of the Byteball Use-a-Thon in Venezuela, the aim was to basically put the platform in the hands of people we knew would be able to identify real use cases. The university setting made sure the platform was in the hands of innovative, bright and entrepreneurial young people. The winning project of the Use-a-Thon identified one of the very important keys to adoption: A fiat off-ramp, enabling merchants that accepts Bytes as means of payment, to easily and quickly convert their Bytes to the local currency to be able to pay for stock and expenses. Particularly Venezuela sees a great future using cryptocurrencies and I believe the launch of the Capybara Exchange marks a super important milestone in adoption of the Byteball platform. The need for a fiat off-ramp becomes crystal clear when looking at the story of the charity foundation called @unknownheroes or "Heroes Anonimos". The foundation is run by volunteers risking their own well being to help others cover basic needs for food and medicine. These are just some of the products, they were able to buy from the first Byteball users' donations. Any donation to their foundation is converted to fiat through Capybara Exchange without paying any fees or commisions due to the noble and admirable cause. The money they get are immediately spend on food and materials to be prepared and distributed to homeless and other needing people. To see some of their work, check out this article. 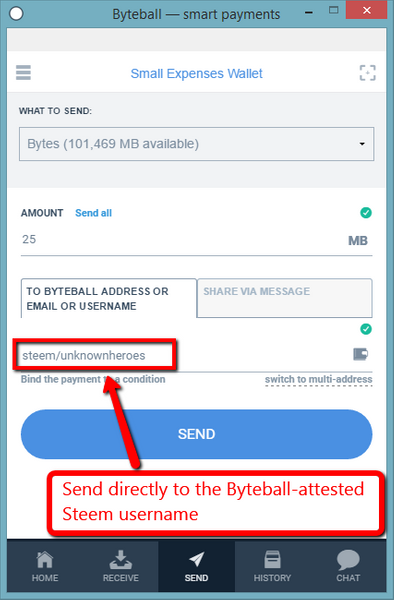 As is the case with all users who chose to attest their Steem username publicly, the easiest way to send Bytes or other assets to that user, is to simply send it to their Steem username. Remember to put "steem/" in front of the username and omit the @-sign too. As you can see in the screenshot above, the Unknown Heroes foundation can be specified by simply typing "steem/unknownheroes" in the recipient field. In your transaction history, you will be able to see the Steem user it was sent to as well. Thank you very much for this post :) we will keep working hard for implementation and a way to help people. Bienvenido a la comunidad de steemit, espero te guste y puedas generar un dinero extra, te sigo, un gran saludo! Please @punqtured , i won a bet on byteball bettings but i was not able to transfer the money to my account. It seemed to me an excellent work friends, I also have a help project that I would like to raise them that I think would be very interesting and most importantly we would help many people. I follow you and a big hug.